If you would like to be notified when the Behringer C1U Studio Condenser Microphone with USB becomes available please enter your email address here. Recording and Podcasting Never Had It So Good!The C-1U is a digital home recording or podcasting enthusiast's dream come true. This professional quality condenser microphone is identical to the acclaimed BEHRINGER C-1 mic with one awesome difference: it has a built-in USB interface so you can be ready to record faster than ever, and with minimal preparation and equipment. Just plug it into your computer and start recording! 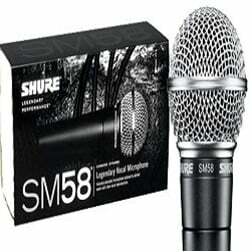 Considering purchasing the Behringer C1U Studio Condenser Microphone with USB? Have questions? Ask people who've recently bought one. Do you own the Behringer C1U Studio Condenser Microphone with USB? Why not write a review based on your experience with it. Bought this to work with the PC and it is as simple as plug it in, let the PC find the software and go! nice sound with a very sensitive pick up, you need to kill all background noise or it will be picked up by this mic. Seen a video for Behringer C1U Studio Condenser Microphone with USB online or have you own video? Check out Behringer C1U Studio Condenser Microphone with USB on DJkit.com!